Wild bunnies, constantly on alert for predators, are tense and nervous. By contrast, domestic pet bunnies today mostly live inside homes, where their charming personalities emerge. Smart, funny and curious, they entertain with their antics and occasionally curl up in laps for soft snuggles. A healthy, well-socialized bunny rabbit is a welcome addition to many families. A young girl holding her pet bunny outside. A pet rabbit should be housed inside. He's a social animal, and he'll wants to be near his people. Provide him a cage that's at least 4 feet wide and 2 feet tall. A larger cage is even better. Avoid wire-bottom cages, which can cut his feet. Line the bottom of the cage with straw to make it soft and warm. Bunnies are prone to overheating and can die if left in the sun. Never leave your bunny rabbit in a sunroom, car or enclosure. Let your bunny play and exercise in the house, but keep a close eye on him, particularly while he's young. A rabbit may chew on electrical cords or pull lamps down. A bunny can also destroy furniture, flooring and woodwork by chewing, scratching or soiling. 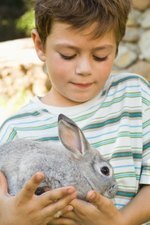 For unsupervised play outside his cage, provide a pet rabbit with a safe, rabbit-proof room. Never leave him outdoors to play -- he could become prey for neighborhood cats and dogs, wildlife or large predatory birds. Feed your bunny rabbit primarily fresh hay, vegetables and commercially prepared rabbit pellets. Offer fruit occasionally as a treat. Hay keeps a bunny's intestinal tract clear of hairballs. Offer alfalfa hay to a baby bunny beginning at 7 weeks. A pet rabbit can have unlimited access to hay as long as it's kept fresh and dry. Switch to timothy, oat or grass hay when your bunny is 7 months old. Quality pellets should be fresh and should consist mostly of fiber. Offer unlimited pellets to your baby rabbit at 7 weeks. Decrease the pellets to a half-cup for every 6 pounds of body weight once he's about 7 months old, and decrease again to a quarter-cup per 6 pounds at 1 year of age. Vegetables are an important part of your bunny's diet. Introduce them, one at a time, in small quantities when he's 12 weeks old. Increase quantity at 7 months. When your rabbit is a year old, provide at least 2 cups of fresh leafy greens every day. Your bunny will enjoy brief playtimes and can even learn basic tricks. Spend plenty of time with your pet to encourage bonding, but realize that he will want to play independently sometimes. While bunny rabbits can be very snuggly, they don't always want to be held. When you do hold your rabbit, place one hand under his rear quarters and the other under his front paws so you don't hurt his spine when you lift him. Speak quietly to him, and pet him while seated; most rabbits get nervous being moved around. Brushing your rabbit, another way to bond with him, can be beneficial to his health. Bunnies are prone to blockages in their intestines, often caused by hairballs. Frequent brushing with a grooming brush minimizes hairballs -- and many rabbits enjoy the pampering. When you bring home a baby bunny, find a veterinarian who specializes in small animals. Take your bunny for an initial health checkup to make sure that all is well. Ask for advice regarding nutrition, health and safety. Have your rabbit spayed or neutered when appropriate to avoid aggressive behavior, minimize chewing and improve litter box training. If you share a home with small children, supervise bonding time between them and your bunny. A rabbit is fragile and easily injured. Don't allow your child to pick up the bunny or carry him around. When your rabbit is scared, he'll claw and bite, which can result in your child dropping and injuring him. Bunny rabbits my suffer from intestinal blockages due to hairballs or lack of exercise. Signs of this problem include a diminished appetite and an increase in the size of droppings. Evidence of bacterial infection includes lethargy, diarrhea, fur loss and discharge from the eyes or nose. Seek veterinary care immediately if your rabbit exhibits any of these symptoms. How Do I Know My Rabbit Is in Heat & Ready to Breed? How Long Does a Domestic Rabbit Live?